We do accept Purchase Orders. Payment terms: NET 45. Please review the following information to submit your order. NOTE: ALL orders are processed online through our shopping cart system, including orders paid for by purchase order. By following the steps below on your own, as a customer, you will help to ensure accurate billing and shipping information is entered, as well as save time so you will not have to wait for a sales member to process your order, which can take 2-4 business days. Step 1: Browse to the products at languagedynamicsgroup.com. On a product page, select the “Click Here” button to upload your purchase order (this only has to be done once per purchase order). Add your desired items/quantities to your shopping cart. Note: you may also submit by your purchase order by email, fax. Step 2: Proceed to checkout. You must be a registered user to make purchases by Purchase Order. If you are a new customer, select the orange “Register” button. If you are returning customer, login with your user name and password. 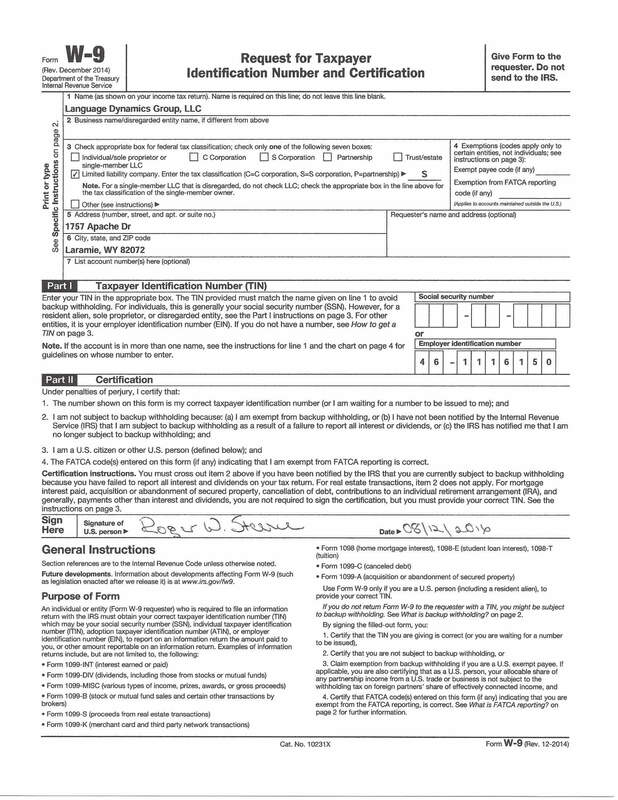 Step 3: Fill out the appropriate billing and shipping information for your order. Step 4: Use “Purchase Order” as your method of payment and enter in your Purchase Order Number in the field provided. Nothing will be charged to you now. You will receive an email with your receipt of purchase which, will show your order number as well as note your purchase order number associated with your order. We will not process or ship the order until we have received your official purchase order either by upload, fax, or email. Step 5: When we receive your online order + your purchase order, we will ship your items. PAYMENT TERMS: NET 45. Language Dynamics Group provides the following W-9’s solely as a matter of convenience for our customers. The W-9’s comply with IRS regulations.